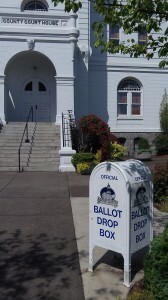 A ballot drop box outside the Benton County Courthouse. The Oregon Voters’ Pamphlet for the May 20 primary has arrived. It is a source of lots of helpful information, even though the material submitted by candidates often raises more questions than it answers. The secretary of state prints the candidate statements exactly as they are submitted except for fixing the spelling in cases where a word as submitted is not in the dictionary. This is helpful because it tells you something about candidates. If you like your office holders to be more or less familiar with grammar and punctuation, for instance, you can use their pamphlet entries to evaluate them on that score. Jo Rae Perkins after KGAL’s “Valley Talk” this week. The pamphlet is no substitute for listening to candidates, or to questioning them face to face. 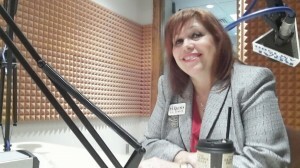 I had a chance to do just that with Republican U.S. Senate hopeful Jo Rae Perkins of Albany on KGAL’s “Valley Talk” hosted by Jeff McMahon on Wednesday. It’s always fun to hear Perkins let fly with her strong opinions. Her chances in the state GOP primary may be small, but there’s no doubt she’s an energetic campaigner, having driven her bright yellow Corvette to events all over the state. All five contenders for the GOP nomination to face Democrat Jeff Merkley in November have statements in the pamphlet. You can read them to get a feeling of how much sense they make in general, or how closely if at all they represent your own points of view. The pamphlet has another virtue: By explaining in detail what it takes to register as a voter, it sheds light on the controversy over voter-ID laws in other states. Oregon requires would-be voters to swear they are U.S. citizens, but that’s about all. If people can’t supply a driver’s license or social security number to prove their identity, they can submit copies of a paycheck stub or a utility bill. Having no ID bars them from voting in federal elections, but they can still vote in state and local ones. Voters must be registered by April 29 to vote in the 2014 primary election, which will end on May 20. I doubt fines or deportation is a deterrent. You can’t get blood out of a turnip and they’ll just return the same way they got here in the first place. The ability to cast an illegal ballot to make things easier for “Illegals”. The Democrat/Liberal controlled govt. WANTS voters that want govt. assistance. One item that all the Democrat candidates tap dance around is Obamacare. Remember when you go to vote that not one Republican in Congress voted for this abomination. Peter DeFazio doesn’t even mention it, although he is big on “fighting climate change”, whatever that is. And our Governor touts his leadership of the Oregon Obamacare epic failure boondoggle by telling us it “will keep people healthier at significant lower costs”. Now there’s a load of bovine manure if ever there were one. All the votes for Obamacare were Democrat votes – they own it. This is the party of tax, spend and regulate – no matter how they pretty it up in the Voters Pamphlet.